This photo was transfered from my Fujifilm camera to my phone via wifi and, in turn, to my blog. I know it’s sort of old tech (old tech, of course, means over a year old), but it’s a first for me. I also rarely post unedited photos, usually prefering to shoot RAW, but this is the jpeg straight from the camera, after converting to black and white. I can also count on one hand the number of times I have posted directly from a phone. 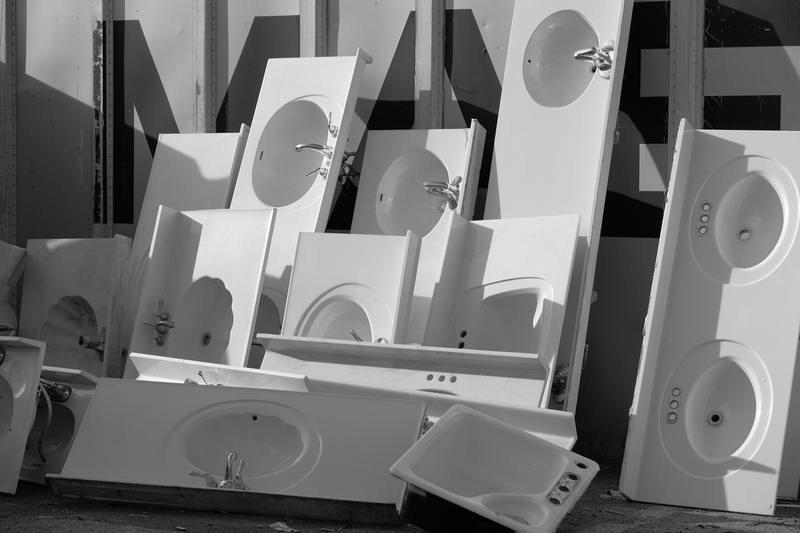 I spotted these sinks in front of a remodeling recycling center and thought they were interesting enough to shoot. Unfortunately I couldnt shoot them straight on as there was a truck parked in front of them. Not knowing if I would be able to visit the scene again I just shot them at a slight angle. I actually think the angle made for a better shot.